According to the Center for Disease Control and Prevention (CDC), in 2010, 2.6 million injuries from falls occurred among older adults in the home. Most injuries take place when the person transfers from the bed to the wheelchair, or from the unassisted use of a walker in the bathroom. Frequently, older people who fall suffer lacerations, hip fractures, and head injuries. The CDC recommends that many of these injuries and hospitalizations could have been prevented with the use of grab bars and bed transfer bars. Activities of daily living (ADLs), such as the ability to transfer, to manage dressing, to bathe, and to prepare meals, are the basic day-to-day tasks of self-care and personal hygiene. The ability to perform ADLs safely and completely determines if people are capable of living independently at home. The use handicap grab bars provides people with a supportive and safe way to perform ADLs and maintain independent lifestyle. Bed transfer bars placed at the bedside provide safe support for transfers from the bed to wheelchair or walker. Pulling up on the vertical bar provides support and steadies a person with weakness or balance impairment. Vertical poles placed near the closet make it possible for a physically challenged person to dress themselves and perform basic ADLs in a safe manner. Grab bars installed next to a toilet in the bathroom provide the greatest amount of safety and support for people who have difficulty sitting down or pulling up to a standing position. Horizontal bars are ideal for the bathtub, and can be mounted easily on wall tile. The user can maneuver in the shower and perform daily hygiene without slipping or falling in the bathtub. The American Disabilities Act (ADA) has guidelines and specifications for safe and optimum use of grab bars. All grab bars should be fixed and not rotate in their fittings, and the mounting height is universally 33 to 36 inches from the grip of the bar to the floor. All ADA style grab bars should support at least 250 pounds of force. Grab bars costs vary with sizes and finishes and may range from $20-50 for transfer and support grab bars. Vertical poles may cost between $30-200, depending on which style is selected. Maintenance is low, and most bars stay in a firm position for years. Having a floor to ceiling grab bar can offer many benefits to those that require assistance with movements. These sturdy handicap standing poles and grab bars are easy to use, do not damage structures during installation, extremely versatile, assists you when standing up and are comfortable to use. 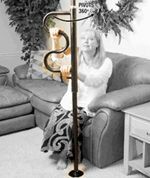 Due to the jackscrew installation process, these medically assisting vertical poles and bars can be installed anywhere in the home that has a floor and a ceiling. With the floor support, it has withstand more weight than a standard grab bar. They are also able to be used in the bath or shower, will never rust and come with extenders for taller ceilings. Using a floor mounted grab bar, you will be able to give your loved one the freedom to be able to accomplish some of their daily living tasks independently. By giving someone independence while providing them safety, you increase both the patient and the caregivers’ satisfaction. These handicap super poles are also appropriate for larger users as the poles support a weight limit of 450 pounds, which allows larger users freedom and independence. 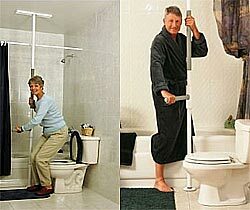 There are many situations where a floor to ceiling grab bar can be useful. Here are a few examples. Help someone rise from beds or chairs. To assist someone in showering without assistance. In the bathroom, floor mounted safety bars are excellent support devices for wet environments. Provide floor mounted grab bars for toilets and allow someone to use the toilet without assistance as an alternative to toilet safety rails. Allow for support in any situation where a patient may need assistance in moving and transferring. Floor supported grab bars that can take more weight. In addition, a handicap pole is also great in helping those recovering from joint replacement. Those temporarily handicap will find the floor mounted grab bars are a perfect aid around the home as they slowly recover. Floor mounted grab bars range in price averaging from $180 for the regular pole to $240 for the super pole to allow for an increased weight capacity. Here are some recommended floor to ceiling grab poles that go vertically from floor to ceiling. They work in many environments and are great bathroom grab poles. Floor Mounted Toilet Side Rails – These are floor mounted grab bars for bathrooms and are usually placed next to toilets. They fold down when in use and can be folded back up with not in use. See more examples and read more about these toilet side rails before you make a purchase. In order to meet American with Disabilities Act guidelines, handicap bars should be, 1 1/4 to 1 1/2 inches thick, shall have a bending stress, shear stress, shear force and tension force of at least 250 pounds, must not rotate within its fittings and must not have any sharp surfaces or abrasive elements, edges should have a minimum radius of 1/8 inch. Continue to maintain safety, regain independence and freedom with the floor mounted bars.